Eric Kesner is very much a creature of his guitar. His 20 year relationship with this instrument has evolved above that of incendiary guitar leads and commanding power chords and on to an area beyond where forms of melody and rhythm restrict the reach of his creative endeavor. 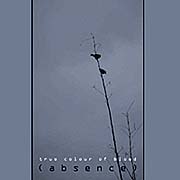 Under the name True Color of Blood, Kesner has released the album (absence) (65'20") - a sonic journey where time is regarded as a river without banks and space created internally from sound. The eight auricular expressions on (absence) are each their own dense and flowing stream of sound - exposing Kesner's inate sense of drama. With its vague form and latent structure, (absence) keeps the listener's intellect searching through the crimson subject matter - which ranges from ambivalence to amazing self-expression. "Oracles of a Dead King" (10'56") followed by "Non Ens" (8'40") are the sensorial and somewhat reassuring pieces casting their thin light at the opening of the album. "The Secret Doctrine" (5'05") and "Close Your Eyes and It Appears (8'08") replaces the sonic pillow upon which the listener dreams with a dark neural drone. "Anamorphous" (4'24"), with its shimmering tones and reverb drenched breathing harmonies, comes closest to a narrative arc and the recognizable sound of guitar. "Last Day on Earth" (12'13") is the curiously claustrophobic yet empty conclusion to this recording; rescued only by a bright cogent coda in the album's hidden uncredited track. Kesner's work here represents a continuum of enigmatic pieces out of the Dark Ambient realm. Often abstruse and clouded, his music inhabits the night and the expansive internal world of sleep and contemplation - just as darkness holds the night and our own smallness in its enormoity.